Added on 23 January 2019 . By Olivia Cheves. Urban axe throwers, Whistle Punks, are looking to take over the former Panache nightclub in Bristol. 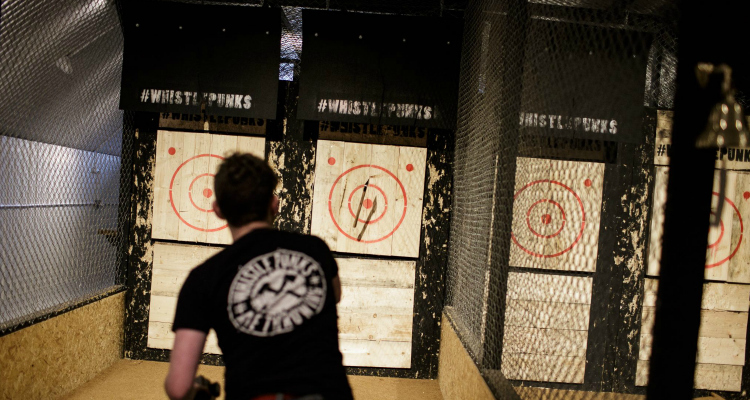 One of the surprise breakout hits of the last few years, the pursuit of axe throwing has been making waves across the UK with the help of urban axe throwing outfit, Whistle Punks. The premise is simple: get axe, throw axe, miss bulls-eye, get angry. With hugely successful venues in London, Birmingham and Manchester, the company have set their sights on Bristol for their next launch, and it's going to be a big one. Taking over the site of former nightclub Panache, the proposed city centre venue would be Whistle Punks' largest yet - twice the size of their London location - and could end up as their flagship location. So if you've ever had a hankering for chucking some hatchets about, your dreams could be about to be brought into sharp reality. Whistle Punks intend to take over the Panache night club, All Saints Street, Bristol, BS1 2LZ.